Taste test: These tubular, corn-based snacks taste sort of like Doritos, but the cheese taste is much, much weaker. The rings are fairly thick, so the proportion of flavoring to chip seems to be much lower than average. 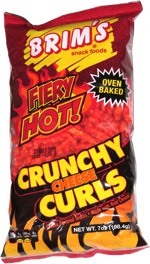 The rings aren't bag, though: good crunch, and a nice change from your usual tortilla chip. Smell test: Very weak cheese smell.